SEE HERE FOR THE ORIGINAL ARTICLE AND THE FULL SET OF PHOTOS. 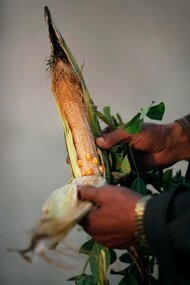 Damir Sagolj, a Bangkok-based Reuters photographer, was among a group of journalists invited last week by North Korea’s Economy and Trade Information Center to document the food crisis in the country’s farm belt. North Korea has appealed for food aid after a harsh winter and a series of summer floods and storms, but so far, only 30 percent of a United Nations aid target has been met. Damir Sagolj/Reuters Pak Su Dong, the manager of the Soksa-Ri cooperative farm in South Hwanghae Province. Sept. 29. Alertnet — a humanitarian news service run by the Thomson Reuters Foundation — asked Mr. Sagolj to spend a week traveling in Pyongyang, the capital, and South Hwanghae Province with a reporter and video journalists. The tour, which presented an image of a region in distress, was controlled by government officials. “The regime’s motive in granting the access appears to be to amplify its food-aid appeals,” wrote Tim Large in the Reuters report, which was published Friday morning. Mr. Sagolj’s work has been featured often on Pictures of the Day — notably from Japan, Thailand and Pakistan. He was born in Sarajevo in 1971 in what was then Yugoslavia and spent five years in the Bosnian army. In 1997, he joined Reuters, where he is chief photographer in Thailand. Kerri MacDonald interviewed him via e-mail. His responses have been edited. This trip was organized and tightly controlled by government officials. We were, as you can imagine, not free to do what we would like to do, or to photograph what we would like to photograph. However, the visit included rare access to collective farms, orphanages, hospitals, rural clinics, schools and nurseries where we photographed farmers, children, orphans and had at least a glimpse at their daily life. This was my first-ever trip to North Korea. But as a teenager, I spent years in the former Soviet Union and former Communist bloc, where my father worked as a correspondent for a Bosnian newspaper. So certain things I’ve seen in North Korea were not new to me: collective farms, tightly controlled movement, streets with no advertisements, shops with very little to offer, empty roads, propaganda music and posters on every corner. But there was some sort of order, which makes this crisis very different from the chaos we see in countries like Afghanistan or Pakistan, Iraq or the Balkans. Damir Sagolj/Reuters Orphans suffering from waterborne diseases waited to be examined for possible signs of malnutrition. South Hwanghae Province. Sept. 29. I have worked with government officials that follow every step I make on many occasions earlier in my career — in Saddam Hussein’s Iraq, in Iran, or embedded with different armies. Only a few weeks ago, on a very different occasion, with very different hosts, I had an exclusive access to shoot and write a story on a United Nations war-crimes tribunal for the former Yugoslavia. I was the first journalist ever to report from inside its detention unit since it was established in 1993. As you can imagine, that was controlled, too. There were doors I could not peek behind, although to do so would have satisfied my curiosity. One can argue about the freedom of press, but rules are rules in different places. If you don’t follow them, there will be no pictures and no witness report. It is similar with the hospitals we visited in Haeju, North Korea, where we saw just part of the story. There were not many patients there. When we asked why, officials would give us different reasons. One was the lack of transportation. A doctor told us that one mother traveled about 45 miles on her bicycle to bring her sick child to the hospital. Some of children had purple paste on their faces. An expert from Doctors Without Borders who was traveling with us explained that that is normal. It works as an antiseptic, but it also makes wounds, and cuts dry faster. It certainly made my pictures stronger, although the condition of the child I photographed — his tiny body, almost no signs of life — made them strong even without that detail. Some of the children in the hospitals had their mothers next to their beds. Some had younger relatives accompanying them, as their parents had to work in a field. In orphanages there were kids huddled together on the floor of a very basic clinic, looking straight into my camera. Their eyes burnt through the lens as experts from Doctors Without Borders were measuring their mid-upper arms, a standard test for possible signs of malnutrition. Still, they just looked straight into us, no crying. They sang “We Have Nothing to Envy” (an anthem to North Korea’s policy of self-reliance) as we were leaving. The hardest aspect of the assignment, as in many in my career, was to see kids suffering, knowing their status might not change before it’s too late. It is always difficult to leave a room after photographing a helpless child, weak and sick, whose life might be very short even by North Korean standards. According to the U.N., North Koreans live on average 11 years less than South Koreans, due mainly to malnutrition. I have never seen so many pictures — through the window of our bus or just walking the streets — without being able to capture them. I had to follow the strict instructions of the officials. But knowing the nature of the regime in North Korea and how difficult it is for a reporter to work there, what we have seen in the provinces is more than we expected. It was a rare trip, different from the routine coverage of the military parades and mass games that foreign journalist usually see in the capital. What I managed to photograph — people struggling with food and health in the 21st century, just across the border from a country that has plenty — made this trip worth taking. 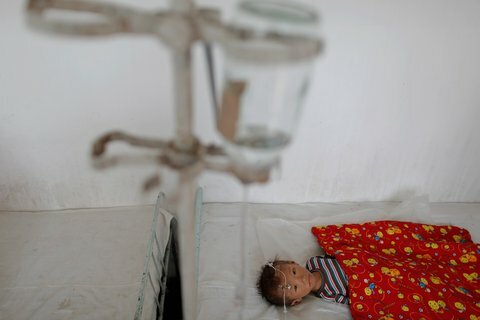 Damir Sagolj/Reuters A child suffering from malnutrition at a hospital in Haeju. South Hwanghae Province. Oct. 1. This entry was posted	on Sunday, October 9th, 2011 at 9:21 am	and is filed under Articles, Korea, News. You can follow any responses to this entry through the RSS 2.0 feed. You can leave a response, or trackback from your own site. 0.033 seconds. Packaged by Edublogs - education blogs.